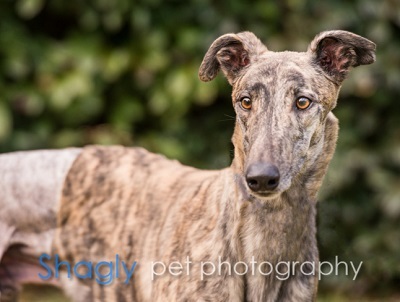 Ruffles, aka Hashtag Rory Mc, is a 2 year old brindle male born December 12, 2013. 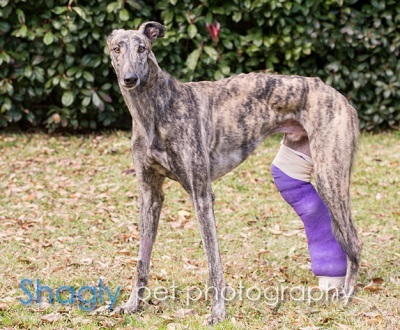 Ruffles suffered a career ending injury on December 9, 2015, with a fracture of his right rear leg. This was his 40th competitive race at Gulf Greyhound Park. A temporary splint/cast was applied at that time. Ruffles is being evaluated by Dr. Bob Radasch of Dallas Veterinary Surgical Center on Tuesday, January 12, 2016, to determine the extent of the injury and to see what further treatment is needed. Ruffles would do best in a home with another dog. Ruffles is not considered to be cat tolerant. 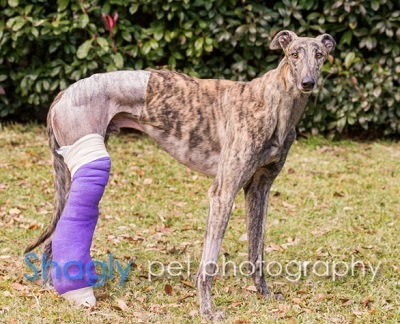 Ruffles had surgery on Tuesday, January 12, 2016, to repair the chronic fracture in his right rear leg just above his ankle. An external fixator was applied which will be kept in place for at least 6-8 weeks. Ruffles will be kept quiet in his foster home. X-rays revealed healing of his injury from December 9, 2015. The external fixator was removed and Ruffles is awaiting his final medical procedures. Ruffles has completed all his medical procedures and is ready to find his forever home! This boy has the most gentle soul of any greyhound we’ve known. Not only is he incredibly handsome and well mannered, he is so very loyal and trusting. Ruffles endured a career ending broken leg that earned him the fast pass to retirement. He’s been an absolute trooper during his rehabilitation – he never cried when we cleaned his wounds and understood that he couldn’t run and play like the other dogs. While most would say greyhounds aren’t watch dogs, Ruff has surprised us when he got startled by a noise and let out a deep bark. He has stated to take a turn patrolling the window by the front door to alert us to any intruders. Ruff is totally content to sleep on whichever dog bed is closest to us, no matter where we are. If we move to get something in another room, Ruff is right there by our side to see what’s happening. He does loves to stand in the bathroom and admire his stunning reflection and is concerned when someone is in the “waterbox”. While he is very attentive, he is not demonstrative – he likes affection and is not a kisser. Ruff does not get on furniture, walks well on leash, gets along with other house dogs and is probably content to be an only dog. He is starting to play with toys thought he hasn’t yet decided their purpose. Now, if there is a treat involved – Ruff gets very animated and excited. Breakfast and suppertime are the most anticipated events of the day and he will happily dance about until his bowl is down. Ruff has been a fabulous house guest and will make a greyt companion.